This is completely random, I literally typed Lucy into YouTube and saw Lucy Hale's name and decided to finally review one of her music videos on my blog; to be fair, I am a fan of her music, so I'm glad that I've chosen this one, with the help of YouTube. Her debut album "Road Between" is certainly worth a listen and she really managed to establish herself as a country music artist, it's just a shame she hasn't continued music, although her acting career has certainly taken off. 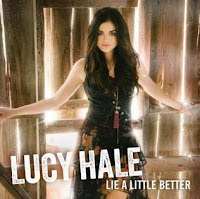 Watch Lucy Hale perform at the Grand Ole Opry House in Nashville, Tennessee while snippets of her having fun with friends and being carefree are cut between in this music video for "Lie A Little Better". Lucy Hale is pretty well known as an actress, she's massively known for playing Aria Montgomery in Pretty Little Liars although she's been in a whole range of TV shows including loved but short-lived Privileged as Rose Baker and the equally loved but also short-lived refresh TV series of Bionic Woman as Becca Sommers; she also won American Juniors with five other children which made up the group of the same name. In 2014, she returned to music, releasing two singles and an album with moderate success. This was the second single and I love this track so much, I just wish it had charted better and helped her kickstart her music career. The song was written by Mike Daly, Chris DeStefano, and Melissa Peirce. Directed by Philip Andelman, the music video must have been a dream come true as we watch Lucy Hale perform at the Grand Ole Opry House in Nashville, Tennessee. She really manages to own the stage and her sense of inclusiveness to her backing band is heart-warming, to say the least. It's nice to see Lucy Hale be herself and full on go for it on that stage. She is clearly meant to be on stages all around the world and I sure hope she comes back to music at a later point and goes on a world tour as I can just imagine the energy she gives out when she performs. Please come to the UK for a gig so I can come and see you, Lucy Hale. This video paints her in a perfect light making us all wish we could go an see her. As for the fun-clips, they're full carefree moments with friends, something that we've all felt but wish we had more of. They're moments that you miss, but in those current moments, it's just you and your friends being yourself and doing your thing. It's cute, but unfortunately unrelatable to the song - if only this struck up a slight narrative, it would be getting the top rating from me, but these clips just make it fall short.